Thanks a lot to everyone who have left comments and have subscribed to the blog. I’m so happy to be able to share my lifestyle with you all. Cook the shrimp in salted water until they rise to the surface and you see them pink. Immediately immerse them in iced water so they do not fall apart. Leave them 5 to 10 minutes. Peel the shrimp (just leave the tail). Place them on paper towels to absorb all the water. Peel avocados and smash them with a fork. Put them in a bowl and add salt, lime juice, onion and ginger. Wash the lettuce leaves one by one. Drain. 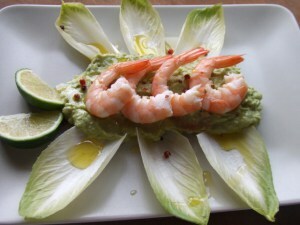 Serve the guacamole over the lettuce leaves, then put the shrimps over the guacamole. Pour a little avocado oil (Mevi Oil is the best one!) and sprinkle with pink pepper.